One of the things I'm digging about VS2010 is its extensibility model. I'm collecting add-ins in VS like I collect Add-Ins in FireFox. 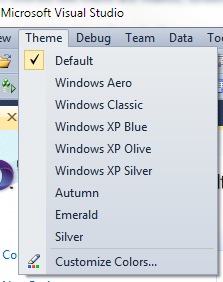 Here's my current of the best Visual Studio 2010 Extensions I'm using. This crazy add-in adds 25 additional commands to Visual Studio! 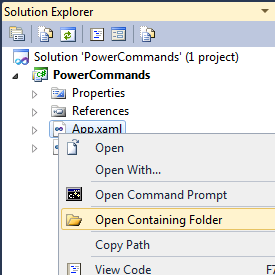 It's a collection of really convenient little improvements like Open Containing Folder and Open Command Prompt. But it's also subtle things like Undo Close that will reopen the most recent tab with the cursor just where it was. There's a lot of Copy/Paste improvements, letting you copy and paste a whole class, or copy and paste references between projects. It even adds "Format Document on Save" that will tidy up your whitespace every time you save your document. Lovely. Where PowerCommands adds lots of little commands in subtle ways, Pro Power Tools changes UI things in much bigger ways. Two of the big changes are the "Document Well" that changes how tabs behave. It'll color tabs based on what project they came from, which is nice for large solutions. It also introduces optional tab recycling that will close old tabs as you open new ones. If you prefer a pile of tabs, you can get multiple rows or columns of tabs. You can also Highlight Current Line, nice for large monitors. It adds HTML Copy that puts code in the clipboard as in the HTML format if if you like, but most of all, it adds a new Searchable Add Reference Dialog. Magic. I'm a fan of BeyondCompare from Scooter Software, but I like integrated stuff as well. CodeCompare is a free Diff tool that runs inside VS itself. It's nice because it's using the VS editor so it has the features you're used to like Ctrl-Scroll to change the font sizes. I wish the two panes changed sizes in sync though, and I've seen one or two crashes. Still, an excellent free compare tool, and I like that I can drag the second file in. 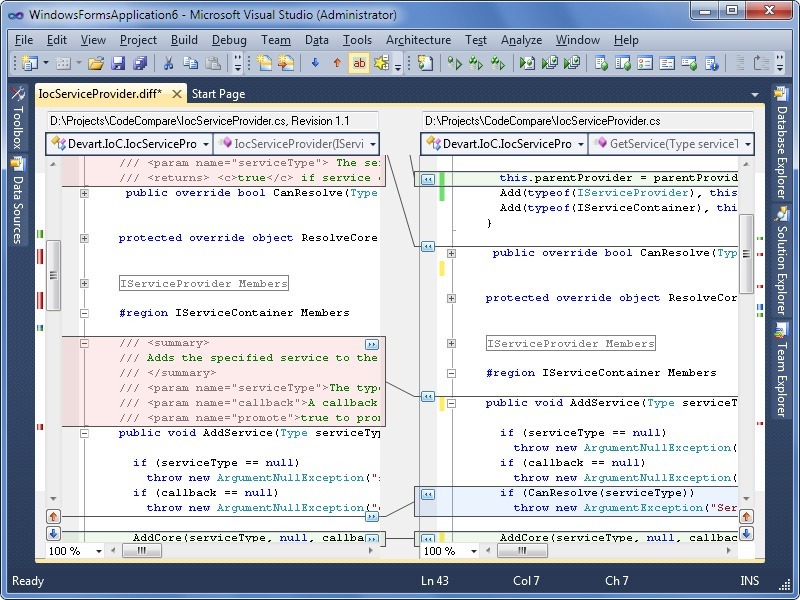 T4 (Text Template Transformation Toolkit) Code Generation is Visual Studio's best kept secret. It's built in and it's yummy. However, there's no syntax highlighting and opening .tt files in Visual Studio directly is a smidge scary, as it's hard to tell what's code generating code and what's the code you're generating. With the free tangibile T4 editor you get coloring and Intellisense. Waldek Mastykarz (SharePoint MVP) has been publishing numerous extensions for SharePoint to extend VS 2010's SharePoint packaging capabilities. Most of them are really excellent for a SharePoint developer and should be part of the toolbox. I have also a license of Beyond Compare and I really like it, but thank for the suggestion of integrated compare. I will give it a try! That last one looks good, T4 is a bit of a pain in the ***. I often get compile errors. But they all look good :) Thanks for sharing! I must admit: I did not have a chance to test them myself. PS: I'm not connected in any way whatsoever to Michael Kiss or AxTools. I already pretty much require Highlighterr for C++ now, even if it does need a lot more work. Dude, you know that something called Windows Live Spaces exists, right??? If MS folks don't feel it is good enough, do you think others will? How soon before it is axed? They pretty much look like mine. I also mentioned the snippet designer. BTW: I prefer the Expression look of Visual Studio. I'm surprised you didn't mention PEX! Pex is one of the most useful things I've used in a while. Really helps tighten up my defensive coding. Will: I guess you did not try the full Pro edition of Clarius Visual T4 for VS2008, right? (http://www.visualt4.com/). The VS2010 will be equally awesome (it's in the works). I like power command, but it just makes my editor flicker while i select something in the editor when working on c++ project. 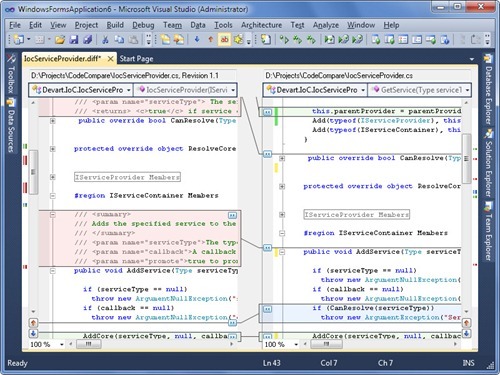 BeyondCompare is easy to integrate into Visual Studio and TFS. 1. Go to Tools -> Options -> Source Control -> Visual Studio Team Foundation Server, and click the "Configure User Tools" button, then click the Add button in the Configure User Tools dialog. In the "Arguments" text box enter "%1 %2 /title1=%6 /title2=%7" without quotes. I really liked metal scroll for VS 2008. 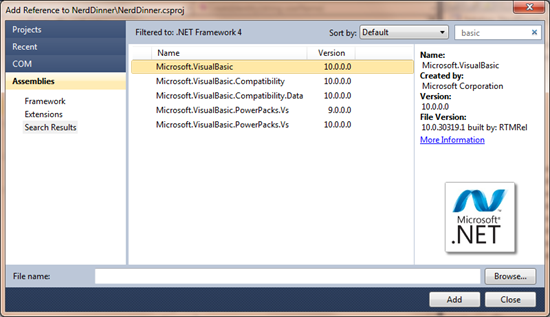 Too bad there is nothing like that for VS 2010. The AllMargins Extension is PRETTY DARN close. 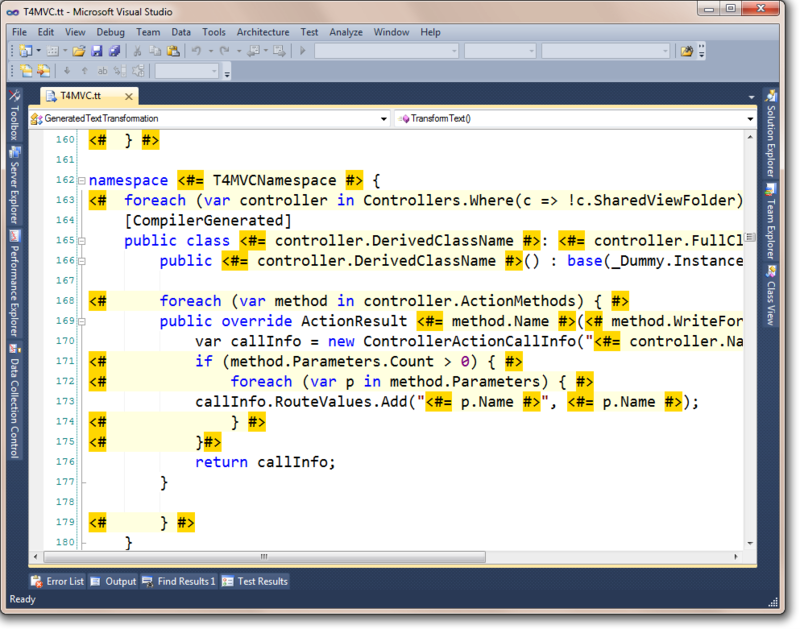 I'm working on a custom extension that allows embedding any external window in visual studio: screenshot. Thanks! I'll look into AllMargins. I was unaware of it. Looks promising. You have to be kidding. Resharper is the only reason I use VS at all. Higthight current line should have been in the first version of VS. R# has it built in. have you guys tried vscommands? It was released for VS2010 but didn't work and is now unavailable. Coding without it is not an option. Is there anything like this for Visual Studio 2008? I think it's time for a new version of this article now that some time has been given for more extensions to develop. http://tinyurl.com/alignby - Noah Richards wrote a similar extension which is distributed with the Productivity Power Tools, but mine is like that, but on steroids. I've written a big description on the extension page. http://tinyurl.com/solexp - Allows for easy maintenance of the solution explorer. It allows you to collapse everything except your current document. And it allows for a less coupled track active item - it doesn't track it automatically but hit 1 button and it selects it.